EXECUTIVE PRODUCER Amy Kellum	met Meinrad Craighead in the late 1990s while involved with a group at Duke University that was exploring Women's Spirituality. She was so taken with Craighead's knowledge of ancient spirituality and its effect on our modern ideas about God that she signed up for one of the artist’s workshops in New Mexico. She began videotaping Craighead's lectures in 2002 and has completed a Certificate in Documentary Studies at Duke based on her work with the artist. Watch God Got Bigger, Amy's 10-minute story of getting to know Meinrad Criaghead. Or watch an interview with Amy. SPONSORING ORGANIZATION The Resource Center for Women and Ministry in the South (RCWMS) is a thirty-five-year-old nonprofit organization dedicated to weaving feminism and spirituality into a vision of justice for the world. Over the years RCWMS has sponsored dozens of workshops, conferences, and retreats on women and religion, equal rights, economic justice, community economic development, health care, and violence against women and children. The organization has mentored and encouraged young women, professionals in religious institutions, writers, and activists. In recent years RCWMS has developed program areas about art, writing, creativity, and spirituality. RCWMS publications include a quarterly newsletter, pamphlets, and a book of essays by Executive Director Jeanette Stokes, entitled 25 Years in the Garden. PRODUCERS Donna Campbell and Georgann Eubanks launched their full-service video production company, Minnow Media, in 2001 with the twin goals of 1) preserving the voices and stories of individuals, communities, sites, and events that are on the verge of dramatic change or silence; and 2) enriching public discussion around issues of individual growth and social transformation. Most recently, Minnow Media earned a Midsouth Emmy for Best Topical Documentary for 2009. Campbell’s work has won national awards from the Corporation for Public Broadcasting, the Association of Women Broadcasters in Radio and TV, and the National Educational Television Association over the last decade. Campbell’s work has won national awards from the Corporation for Public Broadcasting, the Association of Women Broadcasters in Radio and TV, and the National Educational Television Association over the last decade. In addition to her work with Minnow, Eubanks is a writer, educator, and communications consultant. Her book, Literary Trails of the NC Piedmont was published in 2010 by The University of North Carolina Press. 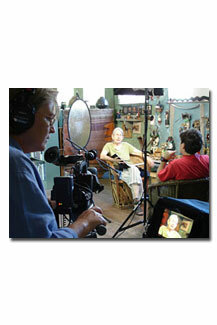 Both Campbell and Eubanks have won Regional Emmy Awards and other distinctions for their documentary work.